Company Overview - Xiamen Yuan An Composit Technology Co., Ltd.
6YRSXiamen Yuan An Composit Technology Co., Ltd.
Xiamen Yuan'an Composite Technology Co.LtdBusiness Type : Manufacturer, Trading Company, Distributor/WholesalerYear Established : 2013Location : 1500 square meter Address : XingQian road 183 ,Jimei District,Xiamen Fujian China (mainland) 361022 Recent Transactions : 1000 orders / monthMain Products : carbon rims , carbon wheels , carbon frames ,carbon handlebarsMain Market : Europe,South/North America ,Southeast Asia	Total Annual Sales Volume : US$5 million -US$10 million,New Products : 3 years warranty 38/50/60/88mm depth 25mm width U shape,clincher/tubular/aero road rims 29er 33mm wide 28mm depth asymmetric MTB rims .Language Spoken : English , Spanish , Portuguese ,German , Italian , Japanese , French ,Korean , Thai .... Average Lead Time : 7 days Response Rate : 90% of buyers who contacted us received a response within 48 hours . Includes Alibaba trade center and Trademanager . 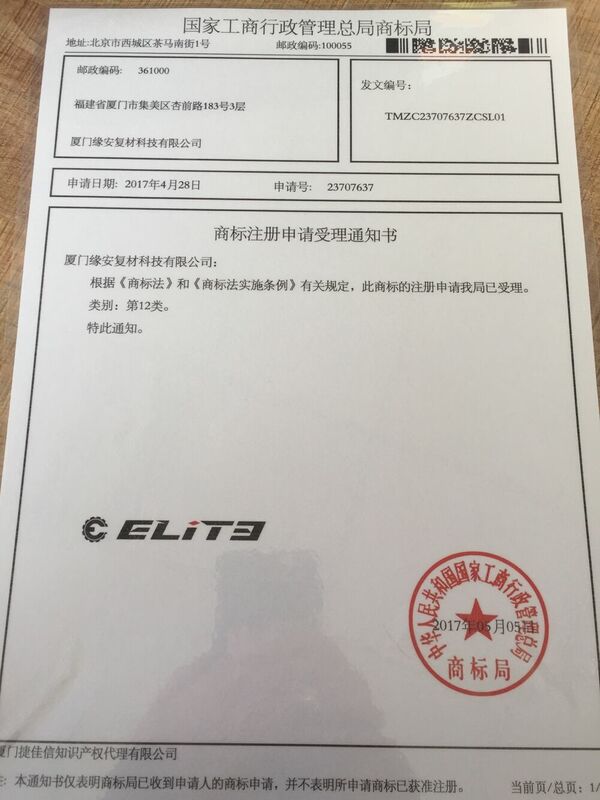 Xiamen Yuan'an Composite Tech Co.Ltd established in Xiamen 7 years ago, we have been striving to inspire and equip enthusiasts to ride .In 2016, We designed new 25mm width road rims and 29er 33mm width MTB rims .All products tested rigorously before shipment . And all the new design rims warranty time is 3 years , we are the first company who can promise so long warranty time . We have own factory and provide OEM&ODM services. We have carbon rims , wheels , frames , handlebars, carbon stems , bottle cages , seat posts and other related carbon fiber composite products . We have a professional design team with rich experience and high level technical ability. We can design and make mold or decals according customers' specifications rapidly , we created over 50 new designs a season . We have many customers like bicycle shop, bicycle club, bicycle team from Europe , South/North America , Southeast Asia,all over the world . We will never beaten on price . We will offer the best quality products,fast delivery, considerate service for you ,We are looking forward to working with your team . Join us now ! About us (2016) : 1. Sponsor Program : We are looking for bicycle team or shop or rider to sponsor, which can help us to promote our brand , get mutual benefit and win-win results.2. New design rims : 3 years warranty , better quality ,better price Why choose us ?Our Advantages:1) Strong design and development capacity: 50 new designs every season. 2) Quality comes first: 70% repeat order rate.3) On-time delivery: No delay complaint or compensation record in past 7 years.4) Partnership focus: We value our suppliers and clients as partners with shared interests. 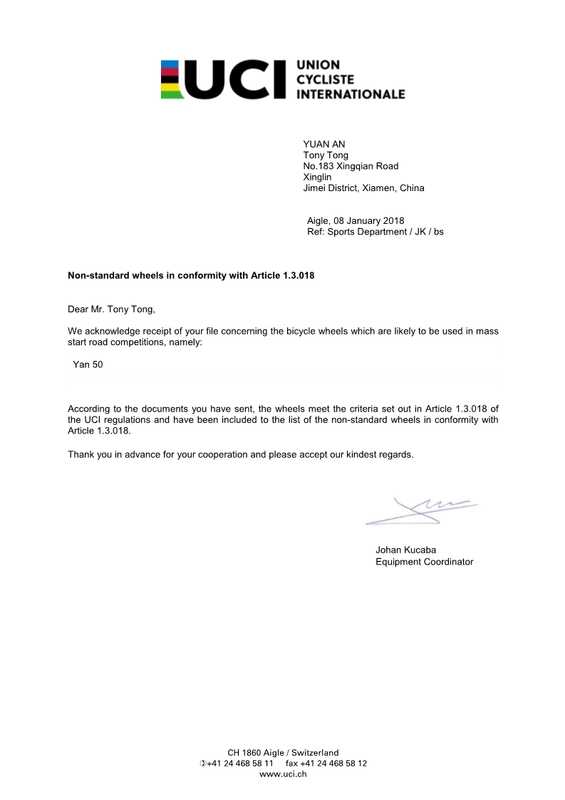 YUAN AN bike wheel YAn 50mm clincher The UCI certificate is obtained.